Many people buy shower rings without thinking too much about what they are getting. Indeed most people think there is only one type, that being the plastic 'C' style rings which are very cheap. What they forget is that they tend to lose their colour over a period of years and will stain the shower rod due to friction. Even if you have standard metal rings (which are usually not rust free) you will find that if you are using an extendable rod the hooks will tug when you slide the curtain back and forth over the join, pulling on the curtain eyelets which will eventually tear. Moldiy have manufactured a new type of shower ring which will combat all these issues. Firstly they are made of stainless steel (type 304) meaning these rings will not rust no matter how many years you use them for. The material is chrome polished meaning they will shine from the reflection of the lighting giving them a very attractive look. There is also a very important and clever enhancement to the standard ring types. 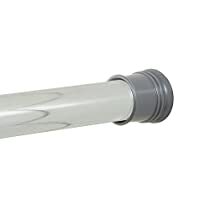 There are five small, roller balls at the top of the ring which no only add to the attractiveness but provide a glide free movement over the shower rod. The beads also irradicate the irritating snag at the shower rod join as the balls simply roll over it effortlessly. 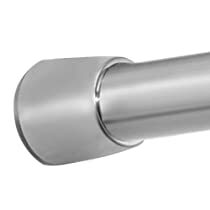 STAINLESS STEEL, NON-MAGNETIC, WILL NOT RUST - With so many different brands of shower curtain hooks on the market it's difficult to know which are stainless steel and which aren't. These shower curtain hooks are 100% pure stainless steel, non-magnetic (type 304) and therefore will last for years without rusting. POLISHED, CHROME PLATED - The shower curtain hooks are chrome plated with a beautiful polished finish. They reflect nicely from the light which will make them elegant to look at in any style of bathroom. FREE GLIDING ACTION - No snagging. No effort. No hassle. 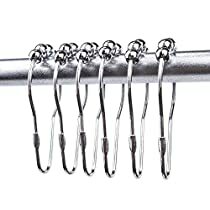 These shower curtain hooks have been designed to glide effortlessly across the rod with virtually no effort at all. CLOSED HOOKS - These hooks are closed, meaning they actually connect together so that it is impossible for the shower curtain to come off, unlike the more popular C-shaped hooks. This means you can pull the curtain as fast as you like and not worry about it falling down. SET OF 12 (69x39mm) - Size is important and these shower curtain rings have been designed for the most common sized shower rail used by 99% of the population. You also get the standard 12 hooks in a pack. I've had shower curtain hooks like these before (the same type of design) and they worked great. So when my old ones rusted, I needed to find new ones to replace them. I found these and though they would be a great deal for the price. I'm sure they would have worked fine... if I could have gotten them open. I'm not sure if I just got a bad batch or what... but I couldn't get these things open wide enough to get the curtain on there once they had been slid onto the bar. It was hurting my hands to try to open them wide enough. I sent them back for a refund. As a wife and as a mom of 3 kids, I spend a lot of time shopping for deals on the best products out there for my family. It's important to me that if we're spending our hard earned money that we get a top notch product in return. I often rely on the reviews and opinions of others when contemplating purchasing a new product that I haven't tried before myself. Because of that, any products that I buy (whether on Amazon or from a 3rd party) I always make sure to leave a detailed review of the product to help others when selecting items to purchase, as well. My family tests these products fully before forming a solid opinion and writing a review. When I write a review, I keep in mind that those reading are also looking for honesty about the product and want an unbiased opinion to go by. If my review has been helpful to you, please give me a "Yes" vote on my review. Thank you! One of them broke when I tried to stretch it around the curtain rod. But you get what you pay for, and I loved the price on these. The curtain stays up just fine with one less hook. Easy to use, the clamps open and close without too much effort.